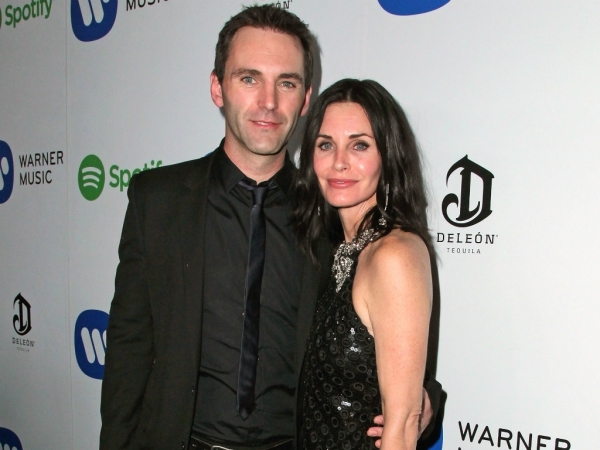 Courteney Cox reportedly fears her fiancé is "drifting away". The 50-year-old actress and Snow Patrol rocker Johnny McDaid got engaged last year and are rumoured to be tying the knot in the near future. However, after a recent snap emerged of Courteney tearfully talking to a pal - thought to be Johnny's friend Foy Vance - it's thought the star is worried about her relationship. She and Johnny have apparently hit a rough patch and are prone to regular arguments. "Courteney told Foy that things with Johnny had been tense for weeks and they'd been rowing over the stress of wedding planning," a source told British magazine Closer. "She fears Johnny is drifting away, and admitted he's stayed at friends' houses after explosive rows. She's terrified of losing him and wants to work things through." This will be the second wedding for Courteney after she previously said 'I do' with David Arquette, who she has daughter Coco with. Although she's openly spoken about planning her and Johnny's nuptials and the complications involved trying to gather their families together, she's allegedly thinking of putting things on hold for the moment. Added to that, as Johnny is from Ireland and all his relatives still reside on the island he apparently wants to hold proceedings back home. "Courtney is desperate for her mother to attend the ceremony, but Johnny said he wants to get married in Ireland. His whole family came to spend Christmas in LA, and he doesn't think it's fair for his relatives to always have to travel. "They are trying to figure everything out so they can get things back on track," the insider added.